A shade over 201 miles, more than a seven-hour round trip into the heart of Kent. Sheffield United’s opening-day League One fixture at Gillingham may set few pulses racing amongst Blades supporters; but new Bramall Lane boss Nigel Adkins admits he can’t wait. “We’ve already started planning the campaign, as a group of staff,” Adkins told The Star. “I started in football at the age of 16, so I’ve had a lot of pre-seasons and fixture announcements, but that excitement doesn’t really fade. “It’s exciting for the fans, of course, as they know where they’ll start the season and they can plan their away trips and the like. “But it’s exciting for us, too. We’ve already started looking at travelling, hotels and training schedules for away trips. United follow up that long opening-day trip to Gillingham by travelling to Morecambe in the Capital One Cup. Last term, they shocked Premier League sides West Ham and Southampton to reach the semi-final, before losing to Tottenham Hotspur over two legs, and former England striker Dion Dublin believes they are capable of repeating the feat. 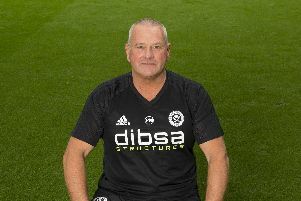 “Sheffield United have, on previous occasions, surprised a few people with some of their results and performances and when you start to look at the latter stages, especially in the Capital One Cup, they can sometimes fly under the radar. I think they’ll have a good run in this competition,” he said. Dion Dublin was speaking following the Capital One Cup Round 1 Draw on behalf of Capital One. Visit facebook.com/CapitalOneUK.